Green hauled in his lone target for a one-yard touchdown reception Sunday in the Chargers' 41-28 loss to the Patriots in the divisional round. Green caught his lone target for eight yards in Sunday's 23-17 wild-card win over the Ravens. He also coughed up a critical fumble. Green caught both of his targets for 12 yards in the loss Saturday to the Ravens. Analysis: Believe it or not, the 12 receiving yards is actually Green's best figure since Week 11, as the veteran tight end has been used almost entirely as a blocking option in his first season with the Chargers. Notably, Green needs just 17 more receiving yards to set a career high, but that doesn't mean much for fantasy owners who expected more production from him in 2018. Green caught two of his three targets for nine yards in Thursday's win over the Chiefs. Analysis: Green saw 38-year-old tight end Antonio Gates catch four passes for 54 yards, reaffirming what has been a troubling trend all season, namely, the former's inability to make any headway in the passing game. Green will aim to eclipse his career high in receiving yards (237) during the final two weeks of the regular season. Green failed to reel in his only target during Sunday's 45-10 win over Arizona. Analysis: Green came into Sunday on a relative streak given his block-first reputation, catching two passes in three consecutive games. Sunday marked Green's third catchless outing of the season. Despite being known for his athleticism as a receiver in college, Green was always more effective in the run-blocking and pass-protection sectors in Denver, and that hasn't changed much in L.A. Sunday brings a visit to Pittsburgh's top-10 pass defense. Green caught two of his four targets for 27 yards Sunday during the 23-22 loss to the Broncos. Analysis: Antonio Gates was surprisingly dominant Sunday, tallying five receptions, 80 yards and a touchdown across just 27 offensive snaps. That should just reinforce the notion that Green is merely second fiddle in terms of a receiving threat from the tight end position, as the veteran appeared in 68 percent of the team's snaps, but saw the fourth-fewest targets of any Chargers pass catcher. Green caught two of his three targets for 30 yards in the 20-6 win over the Raiders on Sunday. Analysis: Green has been utilized a bit more frequently as of late, recording a catch of 10 or more yards in back-to-back weeks. Of course, 58 receiving yards during that stretch isn't anything to write home about, but it's encouraging to see the veteran receive at least some semblance of targets after recording just two targets from Weeks 5-8. A return to Denver, where he played the first seven years of his career, likely doesn't make Green an attractive fantasy option next week. Green caught two of his three targets for 28 yards in the 25-17 win over the Seahawks. Analysis: Sunday was actually one of Green's better games, as the veteran tight end had been held without a catch in each of the previous two games. Green and Antonio Gates have rarely been factors despite the Chargers' high-scoring offense and remain low-end fantasy options even in deep leagues. Green failed to catch his only target in the 20-19 win over the Titans in London. Analysis: Green was hampered by an injury to his ribs earlier last week, but the veteran tight end appeared to leave Sunday's contest without further damage. That's about the only good news for fantasy owners who utilized Green, as the 30-year-old failed to record a catch for the second straight game. Even if he's fully healthy, Green is rarely utilized on offense and has seen more than one target in just three games this season. Green (ribs) won't carry an injury designation into Sunday's game against the Titans in London. Analysis: Green began the week as a limited practice participant but apparently showed enough during Friday's session to steer clear of a questionable tag. The 30-year-old should continue to see a heavy share of offensive snaps for the Chargers, although he mainly functions as a blocker while Antonio Gates remains the team's top-pass catching tight end. Green (ribs) was a limited participant during Thursday's practice. Green (ribs) logged a limited practice Wednesday. Analysis: Green initially injured his ribs against Oakland in Week 5, but he was able to finish out the game. 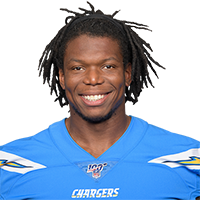 The Nevada product went on to play last week in the Chargers' win over the Browns, drawing 48 percent of the offensive snaps. While it's possible his practice time will be limited throughout the week while he tends to the injury, Green appears in little danger of missing Sunday's game against the Titans. 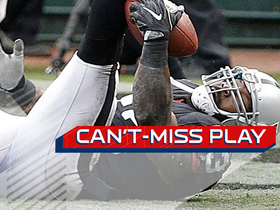 Green caught his only target for a 13-yard touchdown in Sunday's 26-10 win over the Raiders. 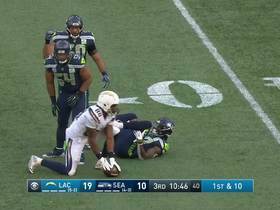 Analysis: Green did leave the game in the second quarter due to a rib injury, but the veteran tight end was able to make his return to the field, capitalizing on a screen pass near the goal-line to score his first touchdown as a Charger. As usual, Green (72 percent) outsnapped Antonio Gates (36 percent), but that didn't amount to much for either player, as the tight ends combined to receive just three targets. Green is questionable to return to Sunday's game against the Raiders due to a ribs injury. Analysis: Green exited Sunday's game during the second quarter. If the second-string tight end is unable to return to the field, expect an update on his health after the conclusion of the Week 5 contest. Green caught both of his targets for nine yards in Sunday's 29-27 win over the 49ers. Analysis: Once again it was Antonio Gates who saw the majority of the receiving role at the expense of Green as the veteran tight end snagged a first-quarter red-zone touchdown. Green continues to see the field (74 percent offensive snaps Sunday), but that hasn't translated to any sort of statistical success thanks to the plethora of weapons available in Los Angeles. Green caught his only target for six yards in Sunday's 35-23 loss to the Rams. Analysis: It's clear at this point that Green's role on offense is blocker first, safety-net second. Despite playing in 63 percent of the team's offensive snaps, Green could only muster a single target as the Chargers struggled to grapple with the Rams' litany of defensive stalwarts. While Antonio Gates saw fewer snaps (22) than Green, he parlayed his limited time on the field into three catches for 45 yards, further cementing the latter's status as the primary blocker. Green caught all three of his targets for 55 yards in the 31-20 victory over the Bills on Sunday. 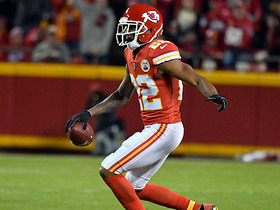 Green caught both of his targets for 21 yards in Sunday's 38-28 loss to the Chiefs. 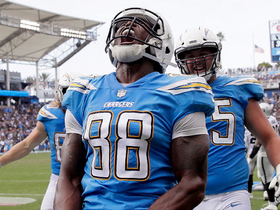 Green is expected to serve as the Chargers' starting tight end Sunday against the Chiefs, despite the team's recent re-signing of Antonio Gates, Jack Wang of The Orange County Register reports. Green started at tight end during Saturday's preseason opener against the Cardinals but he was unable to secure the only pass thrown his way. Analysis: Green was unable to secure a hard pass from backup quarterback Cardale Jones on a simple out route. Depth tight ends Braeden Bowman and Sean Culkin also got a few chances, but Culkin was the only one to catch a pass and he brought down two of them for 24 yards. Green doesn't seem to be in any danger of losing his No. 1 spot on the depth chart, though, and it's difficult to take too much away from a game in which starting quarterback Philip Rivers didn't play. Green appears to be getting comfortable while taking reps with the first-team offense during training camp, Ricky Henne of the Chargers' official site reports. "We're working through how I like things, what I'm expecting on certain routes," quarterback Philip Rivers said, regarding how he's coalescing with Green. "He was in it similarly with [Mike] McCoy [in Denver]. Virgil is going to be just fine." With Hunter Henry (knee) out for the season, Green has an opportunity to earn a significant role in the passing game, Jack Wang of The Orange County Register reports. 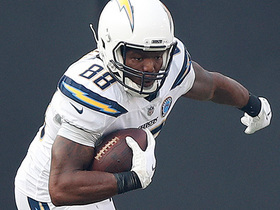 Green signed a three-year contract with the Chargers on Wednesday, Ian Rapoport of NFL Network reports. Green caught 14 of 22 passes for 191 yards and a touchdown in 2017. Green (neck) is not listed on the injury report ahead of Sunday's game against the Redskins. Analysis: Green suffered a neck injury in Week 15, but it was apparently not serious enough to warrant missing action. The veteran is listed as Denver's No. 1 tight end but has only 13 receptions for 185 yards and one touchdown so far this season. Green suffered a neck injury in Thursday's contest against the Colts and is questionable to return, Patrick Smyth of the Broncos' executive staff reports. Analysis: Green was targeted once but did not record a catch before exiting the game. Given the nature of neck injuries and the Broncos' elimination from playoff contention, it would make sense for the team to take a cautious approach in bringing Green back to action. For as long as he is out, expect Jeff Heuerman to see an expanded role at tight end. Green hauled in a 36-yard pass on his lone target during Sunday's 36-9 loss in Miami. Green caught two of four targets for 13 yards during Sunday's 20-17 loss to Cincinnati. Green will likely handle increased snaps Sunday against the Bengals with fellow tight ends A.J. Derby (shoulder) and Jeff Heuerman (knee) ruled out for the contest, Mike Klis of 9 News Denver reports. Los Angeles Chargers quarterback Philip Rivers finds tight end Virgil Green for a 23-yard gain. 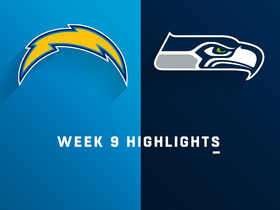 Watch the highlights as the Los Angeles Chargers take on the Seattle Seahawks in Week 9. Los Angeles Chargers tight end Virgil Green takes it 22 yards up the field. Los Angeles Chargers tight end Virgil Green finds a lane down the sideline for a 13-yard touchdown on a pass from quarterback Philip Rivers. Los Angeles Chargers quarterback Philip Rivers pitches an impressive pass to tight end Virgil Green for a 15-yard gain. 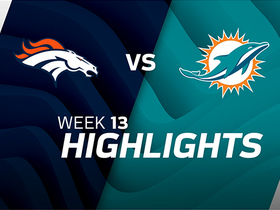 Watch highlights from the Miami Dolphins dominating 35-9 victory over the Denver Broncos in Week 13 of the 2017 NFL season. 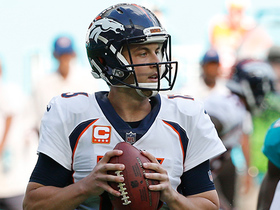 Denver Broncos tight end Virgil Green hauls in 36-yard pass from quarterback Trevor Siemian vs. Miami Dolphins. An unreal end-zone bobble results in Raiders' first interception of the season. 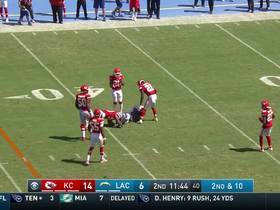 Kansas City Chiefs cornerback Marcus Peters takes advantage of an off throw for second interception of the day. 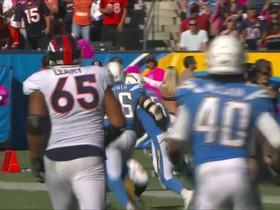 Denver Broncos tight end Virgil Green almost makes a crazy catch against the Los Angeles Chargers.